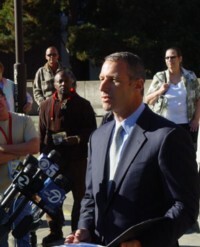 Mayor elect Gary Cloutier (ahead by 4 votes) addressed the press and the citizens of Vallejo from the steps of city hall today. Having served 8 years as a council member, Cloutier has been in one of the closest political races in Vallejo history. Cloutier made a statement of apology regarding his arrest for public intoxication in Palm Springs. 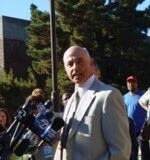 Council member Tony Pearsall also spoke in support of Cloutier. Pearsall emphasized that Cloutier had no intent to drive on the night of his arrest. He drew on his 36 years experience as a Vallejo police officer and spoke about the clear distinction between public intoxication and DUI . It is generally considered police policy to issue a DUI if there is intent to drive or if the keys are in the ignition. Pearsall concluded by highlighting Cloutier's integrity and his good work for the city.